The Oktoberfest is a world-famous festival which takes place on the Theresienwiese in Munich, Germany, running for two weeks between mid-September and early October. It attracts thousands of visitors every day, many of whom travel to Munich especially to be a part of this very special event. For those who can’t make it to the original, other cities in Germany and, increasingly, worldwide put on Oktoberfests of their own, following Munich’s lead and celebrating the specifically Bavarian combination of excellent beer, rich food, easy bonhomie and, of course, traditional dress. 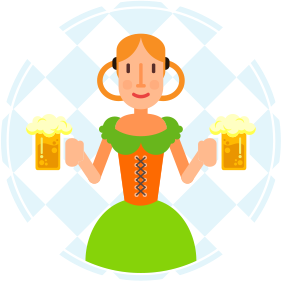 Anyone who really wants to be a part of the Wiesn, as Munich locals call the Oktoberfest, needs to be dressed appropriately: that means a nice dirndl for the ladies and lederhosen paired with a smart shirt for the gentlemen. It’s worth going to the effort, because once you’re at the festival, you’ll love the breweries’ traditional beer tents, the wide range of fairground attractions – both historic stalls and state-of-the-art rides, and the outstanding Bavarian delicacies on offer. Did we mention the beer…? If you want to find out more about the Munich Oktoberfest, this detailed guide is just right for you. Make sure to read all five chapters so that you’re well-versed in all aspects of this fantastic traditional festival and can impress the Bavarians you meet with your knowledge! Chapter 1 Finding your way around the ?Wiesn? The Oktoberfest takes place on the Theresienwiese (hence the name ‘Wiesn’), a large open space in central Munich kept specifically for the Oktoberfest. Located just a few hundred yards south of the main station, you can reach Theresienwiese either on foot or by public transport: as well as Theresienwiese station, Hackerbrücke, Schwanthalerhöhe, and Goetheplatz are all within easy reach. Beside a multitude of smaller tents, the Munich Oktoberfest features 14 full-sized beer tents. In addition to those run by the city’s traditional breweries, there is a wine tent (Weinzelt) and one specialising in fish (Fischer Vroni). Käfer’s Wiesn-Schänke is where the great, the good, and the glamourous go to meet. Find out more about each tent by clicking on it in the map below. Taking its name from the city’s historic royal stables, the traditional Marstall tent has a distinctly equestrian design theme. Its broad range of culinary delicacies and friendly service are its strongpoints. As well as the usual meaty fare, it offers vegetarian and vegan dishes made using organic ingredients. In the evenings, live music makes for a great atmosphere. This is a classic tent in which you’ll come across all kinds of Munich locals – of all ages, too. The menu is heavy on Bavarian trencherman’s food and the beer is Paulaner. The name means “the crossbowman’s tent?, and tournaments are still held out back; at the centre of the tent, the bandstand plays host to a Bavarian brass band playing traditional Oktoberfest music. Almost synonymous with the Oktoberfest, the Hofbräu Zelt is often first on the list of tourists from all around the world. That makes it the most cosmopolitan of the tents – and its capacity of 14,000 puts it near the top in terms of size. If it’s traditional brass band music you’re after, you can hear it here from midday on. When it comes to tradition, nothing compares to Schottenhamel. The oldest of the tents was first set up for the 1867 Oktoberfest and has been hosting partygoers in typical Bavarian style ever since. It probably goes without saying that music is provided by a live brass band. Shooting contests are traditional part of the Oktoberfest, and this tent hosts the annual championship, celebrating the crowning of the “Shooting King? and his wife (that’s how the tent gets its name). Besides its informal yet exclusive feel, this tent is notable for being the only one to offer an app showing when it is too busy and has to shut its doors. Also known as “the Paulaner tent?, Winzerer Fähndl is popular with football fans – especially supporters of FC Bayer München – and also hosts the team’s star footballers. It isn’t just a place for followers of the beautiful game, though: gourmets are in the right place here, too. The décor is typical of Munich establishments. If you want to go celeb-watching, Käfer’s is the perfect place for your stake out. Established as the place to be for the rich and beautiful thanks to its reputation as exclusive and secluded, the chalet style tent is surrounded by a beer garden and kept entertained with music. Fischer-Vroni is the perfect refuge for anyone who is starting to get meat-sweats after a few days of typical Bavarian cuisine, because this cosy tent with the timber-frame cladding specialises in fish grilled over hot coals. Then again, if you do want more roast chicken and pork, you can get it here too. Once you’ve done the party tents and eaten enough chicken, why not try something different? The Ochsenbraterei (literally: “the ox roastery?) tent is a uniquely culinary proposition: its kitchens spit-roast entire oxen. Its atmosphere is upmarket and traditional, yet decidedly festive. What sets the Augustiner tent apart is its strongly family-friendly atmosphere and sense of showmanship: whole barrels of beer can be ordered and are then tapped at the table. It’s a very special tent known among locals as a feel-good option; musically, expect everything from rock and Schlager through to traditional brass bands. This classic Oktoberfest tent sets great store by tradition, so as well as a typically Bavarian interior, it also features a yodeller in addition to its brass band. The atmosphere is festive and the guests ready to party, but the tent also has one of the longest traditions at the Oktoberfest and been run by the same family for seven generations now. Löwenbräu is one of the best known tents at the Oktoberfest and popular both with Munich residents and visitors. Known for its great atmosphere and traditional feel, Löwenbräu (literally “lion brew?) is easy to find thanks to the tower in its beer garden topped by a roaring lion with a glass of beer. In contrast to the other Oktoberfest tents, Kuffler’s specialises not in beer, but rather in wine, offering an exclusive selection by the glass or the bottle. The atmosphere, too, is different to other tents, combining typical Bavarian jollity with the gentle charm of neighbouring Franconia. Thanks to its cosy interior, the Weinzelt is a lovely place to spend a few hours. If you want to be sure of being able to get into a specific tent on a certain day, the only way to do it is to get a reservation for you and your friends. All of the tents have tables open for bookings in three or four-hour slots, with reservations being taken for the afternoon or the evening; generally, the first bookings run through until late afternoon or early evening, with the next reservation taking effect at 4 or 5pm. Nevertheless, all landlords are obliged to keep some tables free of reservations, so there is always the chance of getting into a tent without one. Unreserved tables are open to all (but tend to get snapped up early in the day). If you decide not to take the risk and want to reserve, make sure you do it early, as tents don’t have any trouble getting rid of advanced reservations: if you haven’t booked by early spring, you may find all the available tables are gone – especially the popular weekend and evening slots, which tend to be offered to regulars. Bookings are taken by the tent landlords, either by phone or over the internet, and although the seat itself is free of charge, reservations are only given to customers who pre-purchase vouchers for food and drink. These vouchers are either sent ahead of time or can be picked up at the tent itself. Getting a seat in a tent is important if for no other reason than that it’s the only way to get a tankard of beer; there are very few areas in which a Mass can be ordered standing up. If you don’t have a reservation, the best strategy is to get into a tent as early as possible. Once the party has really got going, it can be very difficult to find any free spaces, and tents generally fill up by 10am latest on the weekends (during the week, things are quieter through until the afternoon). As a general rule, smaller groups have better chances of getting a seat than larger ones. Once tents are at capacity, the doors are shut and security guards count people out and in. If you do find yourself trying to get into a tent that is full, make like experienced locals and try being friendly. The security staff can often be persuaded to let one or two people in. Once you’re in, ask a waiter or waitress if there are any seats free, as this can speed things up. Don’t get your hopes up too high, though. You’ll often find its best to try smaller and medium-sized tents, which are just as authentic as bigger tents (and whose food is just as good).